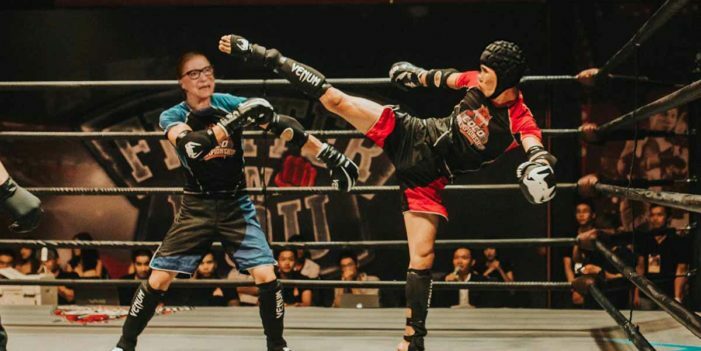 After reporters uncovered a series of training videos showing her sparring in a cage, Supreme Court Justice Ruth Bader Ginsberg admitted today that she had not fallen in her office according to news reports, but in fact had sustained three broken ribs pummeling an opponent in an underground ultimate fighting ring. The Justice, who fights in the strawweight class of up to 115 pounds, admitted she has been fighting in a mixed martial arts circuit in the Baltimore area for the past three years. Despite calls of protest from members of Congress who said that she was prohibited from earning money in a second career while sitting on the bench, Mr. Bofsky said the 85-year-old Supreme Court Justice was not being paid. Sal Unsworth, who trains with the Justice on Thursday nights at Grants Boxing Club in Fairfield, a rough and tumble neighborhood in Baltimore, said the diminutive judge has a bit of a reputation. Although doctors say that Justice Ginsberg, who has bounced back from two rounds of cancer, a heart procedure, previously broken ribs and numerous other ailments, should rest quietly for several weeks, Mr. Unsworth expects her to be back in the ring this weekend.